In Lisbon this summer, we had this divine appetizer: bubbling goat cheese straight from the oven, with honey poured over the top and rosemary sprinkled over the honey. So divine. Since I’ve been home, it’s my new favorite appetizer. I’ve also found a cracker that I really like to make (yes, I have tried a few, and they are usually disappointing). The pairing of the cheese and these crackers is quite nice, but the cheese is by far the star. Great for holiday entertaining. I got the cracker recipe from Sally Pasley Vargas’ blog, and her pictures are gorgeous. You can make this appetizer two ways. 1) Place the goat cheese in an oven proof dish, pour the honey and top, and place 4″ away from the broiler for about five minutes (make sure your dish can handle the heat!). Remove from oven and sprinkle with rosemary and serve immediately. 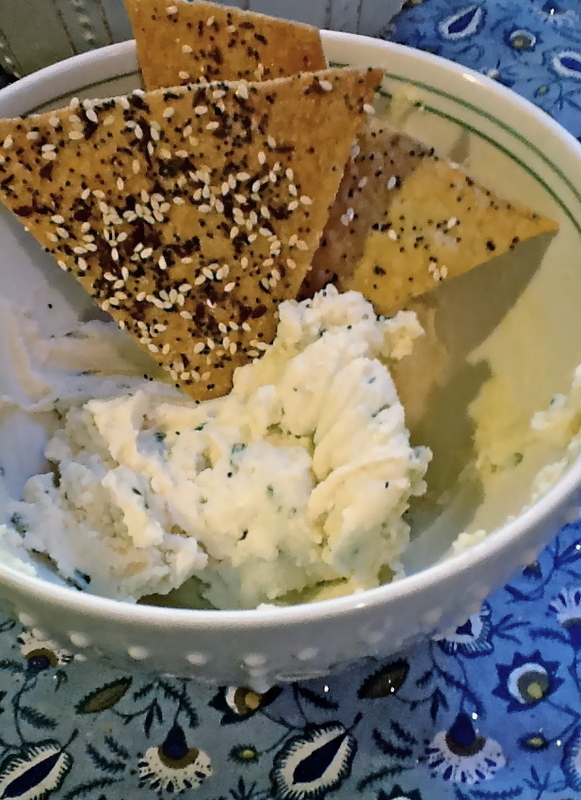 Or, 2) you can heat the goat cheese (on the stove or microwave) until soft and melted, then stir in the honey and rosemary and serve more like a dip (this seemed like a better way for a larger group–the former seems better for small dinner parties). 6 T. seeds such as poppy seeds, sesame seeds, flax seeds, celery seeds, etc. 1. Whisk the 3 flours, sugar, baking powder, and kosher salt in a bowl until combined. Make a well in the center and add the olive oil and buttermilk. Stir, gradually incorporating the flour into the olive oil mixture, until it forms a dough. It should be soft but not too sticky. Add additional buttermilk if it is dry. 2. Turn the dough out onto the countertop. Knead for about 20 seconds, until it is well mixed. Shape into a flat rectangle and wrap in plastic. Refrigerate for 1 hour, or as long as overnight. 3. Heat the oven to 350 degrees. Line 3 half sheet pans (approx 18 X 13 inches) with parchment. 4. Divide the dough into thirds. Lightly flour the counter top with brown rice flour, and flour a rolling pin. Roll one piece of dough into a large sheet that is the same size as the sheet pan and approximately 1/16-inch thick (about the thickness of a quarter.) If necessary, lift the dough and sprinkle a sparing amount of flour underneath it to keep it from sticking. If the shape isn’t working, place the flat of your hands on top of the dough to stretch it into a rectangular shape. Transfer it to the paper. Slip both hands under the paper and lift it onto the baking sheet. 5. Brush the dough with about 2 tablespoons olive oil. Sprinkle it with 2 tablespoons of the seeds and a little flaky salt. Place a piece of plastic wrap on top, and roll over the seeds with a rolling pin to embed them into the dough. Peel off the plastic. 6. With a pizza cutter or sharp knife, cut the dough into thirds the long way. Rotate the baking sheet and cut into 4 equal pieces crossways to make 12 crackers. Trim the uneven outside edges with the pizza cutter. Leave the edges on the baking sheet for tasting. (You can cut the crackers any size you want; this cut will make large squares.) Repeat with remaining dough. 7. Bake for 18 to 23 minutes, or until the crackers are golden brown and crisp all the way through. Let cool on the pan and store in an airtight tin. Lovely! I was just thinking about what to do for Thanksgiving appetizers and I think I have my answer.